Get Rs. 50 for every successful referral to Paytm BHIM UPI. Invite as many friends to earn cashback of up to Rs 10,000. Paytm Refer earn offer for BHIM UPI. Each user can earn cashback of up to Rs 10,000. The offer provides cashback of Rs 50 on every successful referral. You can also earn referral money by inviting friends to Paytm app to recharge and shop. In the meantime, check Paytm UPI Offers to earn on money transfer transactions. Paytm UPI is fast, reliable, and free to do money transfer transactions. Note: Click here to know about Paytm Payments Bank App. The standalone app was recently launched for savings bank users of Paytm. Invite your friends to do mobile recharge on Paytm & earn up to Rs. 1,000 every day. Get Rs. 50 for every friend. Share your unique referral link with friends. You get Rs. 50 cashback after a referred friend completes first mobile recharge/bill payment on Paytm app. Your friend should have never done a recharge or bill payment on Paytm. The cashback will be credited within 7 days of the first transaction of your referred friend. Share any Paytm Mall product link to earn exciting cashback. The cashback amount will vary from product to product. The friend should buy the product via the shared link. The cashback will be processed within 25 days of product delivery. Under Paytm Mall Refer & Earn offer, you get cashback on purchase of your recommended product. The referee should buy the recommended product within 15 days of clicking the shared link. Share the product link with friends & family. Earn cashback on purchase from the shared link. 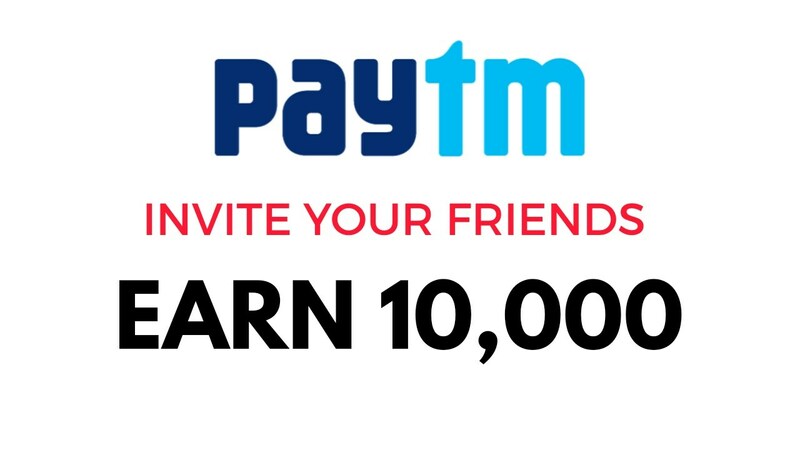 Paytm Referral offer provides a chance to earn cashback of up to Rs 10,000. For participation, invite friends to Paytm UPI. You get Rs 50 for the first transaction of your friend. You have to share your invite link with friends. The more friends that join through your link the more you can earn with Paytm. Note: The cashback will be provided only for first successful money transfer of your friend using Paytm BHIM UPI. The money transfer should be Rs 10 or more. Go to the money transfer tab. Click on Paytm UPI Refer Earn offer. Share your invite link on WhatsApp, Facebook, SMS, etc. Ask your friend to link their bank account on Paytm app using your invite link. Get Rs. 50 on 1st money transfer of your friend on Paytm App. Earn Up to Rs. 10,000 with Paytm Refer Earn offer. The minimum transfer of Rs 10 on Paytm Using BHIM UPI. The referee shouldn’t be on Paytm UPI before clicking on the invite link. Refer Earn offer is valid on Android version 7.2.0 & above and iOS version 7.2.1 and above. The referee should click on the shared invite and link their bank account on Paytm. The person who has received the invite link gets Rs 20 after 2 money transfers of Rs 10 or more. If a person is referred by multiple Paytm users cashback will be given to the link which is clicked first. Here is one more chance to earn free cash with Paytm. If you are a Paytm UPI user, invite your friends to do first money transfer transaction and earn cashback of up to Rs 10,000. Invite as many friends to Paytm BHIM UPI as possible to earn more. Meanwhile, check the latest Paytm coupon codes for cashback on mobile recharge, flight tickets, movie tickets, and online shopping. Paytm is accepted as a mode of payment at local shops. Refer your local shopkeepers, kiryana stores extra to accept payments with Paytm and earn cashback. Now, you can also invite your neighborhood shop owners to accept payment through Paytm. Paytm Refer & earn is an excellent opportunity to earn up to Rs 10,000 cashback. It is simple, refer your neighborhood shop owners to start earning. 1) Visit Paytm Refer & Earn offer page. 2) Enter your details (Name & Mobile No.). 3) Enter details of Referral 1, Referral 2, Referral 3. 4) Press Submit Details button. Note: You can submit details of three local shopkeepers on the offer page. Once the details are confirmed the referrals will be trained by Paytm team to do digital and your cashback will be processed. The invitation is sent and your cashback will be processed soon. Paytm offers are great to earn some easy cashback sitting at your home. Apart from that, you can invite your friends to do mobile recharge on Paytm and get paid on their first transaction. Stay tuned for more such offers and get amazing freebies without any effort in simple steps.